We here at StickerYou think frosted glass always elevates a space. It's great for adding professional design, creating privacy, and can even detract sunlight. We love it so much that all our offices at StickerYou use it! In fact we think it’s ability to make your workplace look it’s best can influence employees to do theirs as well. 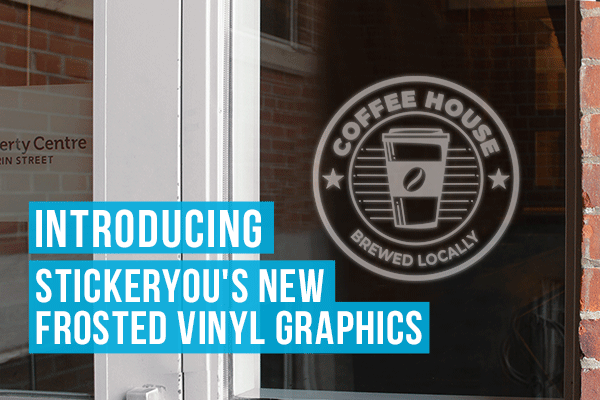 Scroll below to find out more info on our most professionally flexible material yet - customizable Frosted Vinyl Window Graphics. Our custom frosted vinyl graphics are not only easy to create, but apply as well. After you’ve uploaded your image you can determine how large or small you want your transfer. Meaning absolutely any sized shape no matter how irregular will be able to be embellished. Because the material we work with is vinyl, it also makes it incredibly easier for you to install. Have you ever had to deal with the nightmare of ordering expensive blinds and an additional expensive installation fee? Or spent weeks on the design and noisy etching that follows when ordering actual etched glass? 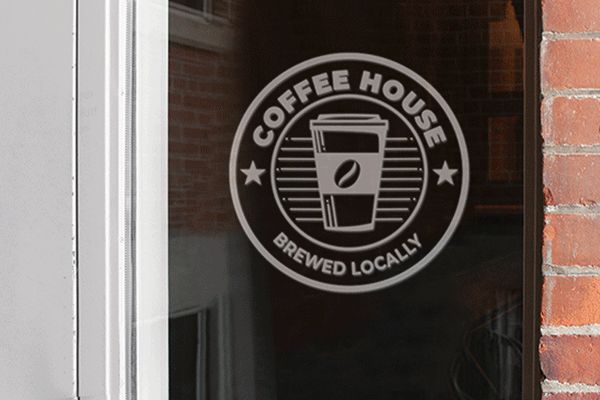 Vinyl window graphics are as easy peeling off the back of a sticker and sticking it on a window. Vinyl is also super removable, which makes adding additional privacy or seasonal branding to rented spaces not only do-able but affordable as well. Removable vinyl also means you can take your frosted graphic to your next temporary office or pop-up and re-use it as many times as you need. We’ve all been in them, big open concept offices with ceiling to floor windows and sectioned off glass walled meeting rooms. An additional feature of this type of architecture (depending on the time of day) is glaring beams of sunlight that not only annoys but blindingly distracts everyone in the work environment as well. 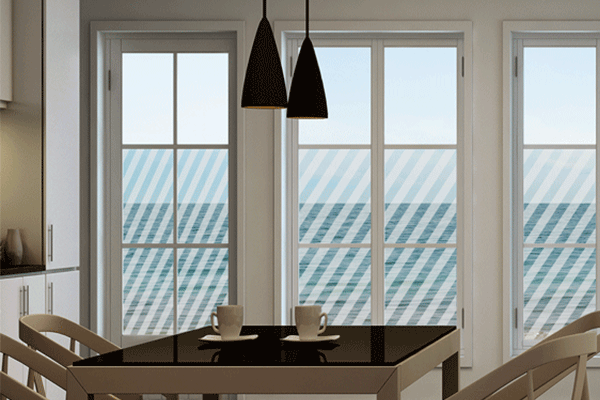 With custom frosted vinyl window graphics you can create simple geographic patterns that can be used an inexpensive blind or curtain alternative that still lets light in, but at a more diffused glow. 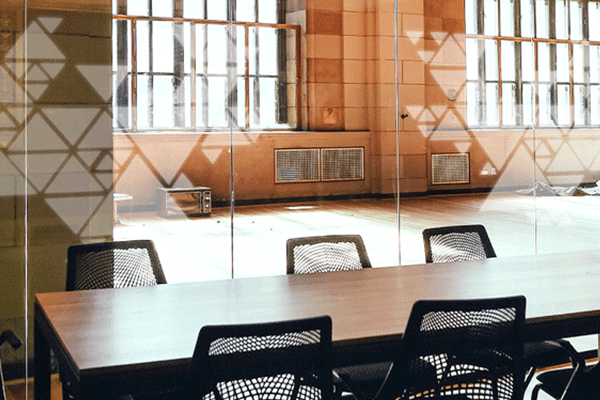 Some offices may be temporary spaces that require client confidentiality, and although glass enclosures do absorb sound better than temporary partitions, they don’t off too much in terms of privacy. Full panel vinyl can instill confidence in your team and clients that you value their personal concerns. 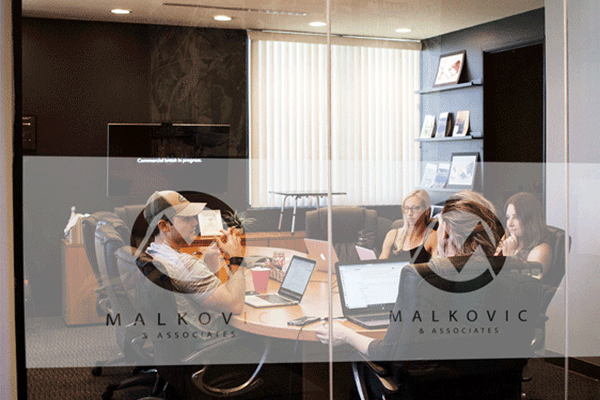 Since our custom frosted vinyl can also be created in various sizes, you can also have partially frosted panels to easily see if meeting rooms are being occupied and by whom. Much like the material itself, the design of your custom frosted vinyl is also as flexible as you desire. For street facing businesses a frosted vinyl window graphic of your business logo makes a noticeably professional statement for passersby. Hours of operation can also be customized with frosted vinyl to tie in your new opaline aesthetic. A huge trend for frosted glass in office spaces is to implement designs into the negative space. This is useful for logos or designs with lots of intricate detail and aids privacy to spaces while maintaining brand identity. Seasonal designs are also great for corralling team spirit and keeping the workplace looking fresh and updated with every quarter. Mirrored surfaces can also benefit from frosted vinyl making for even more branding and promotional real estate in your space. Next time you want frosted or etched glass in your space don't think opaquely - head to StickerYou and fill out a custom order form.